H2 Designs: Still addINKtive Challenges - Just 3 Colours! 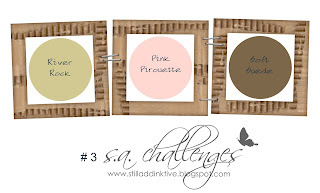 Still addINKtive Challenges - Just 3 Colours! I have used some more new products that will be available in the Seasonal Catalogue from February 1. The soft suede & very vanilla layers have been die-cut, using the new oval framelits. Then the river rock layer was cut by hand, using a craft blade, by running it around the outside edge of the same framelit die that was used to cut the vanilla layer. The edges of the vanilla & river rock ovals have been sponged with river rock ink & the scalloped layer has been sponged with soft suede. The little bow was made from vanilla seam binding, which I dyed first, in a small ziplock bag which had a mix of rubbing alcohol & river rock re-inker in it. I dunked a length of ribbon in the mix, then scrunched it up, squeezed out the excess liquid, spread it out to dry and then tied it in a bow. The colour match was perfect!!! 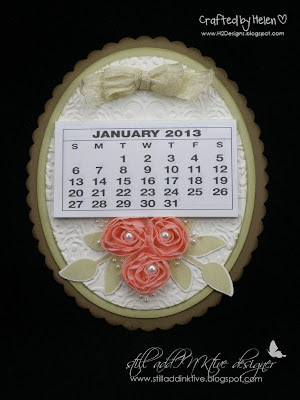 The flowers are also a new seasonal product - ribbon flower trim. I have snipped three blooms off the tulle backing ribbon & coloured them using a mister filled with rubbing alcohol & pink pirouette re-inker. As the flowers dried, I added more colour to increase the intensity of colour & actually ended up with a pretty coral colour. I have added pearls to the centre of each flower & then a sprinkling of the tiny pearls around the blooms. 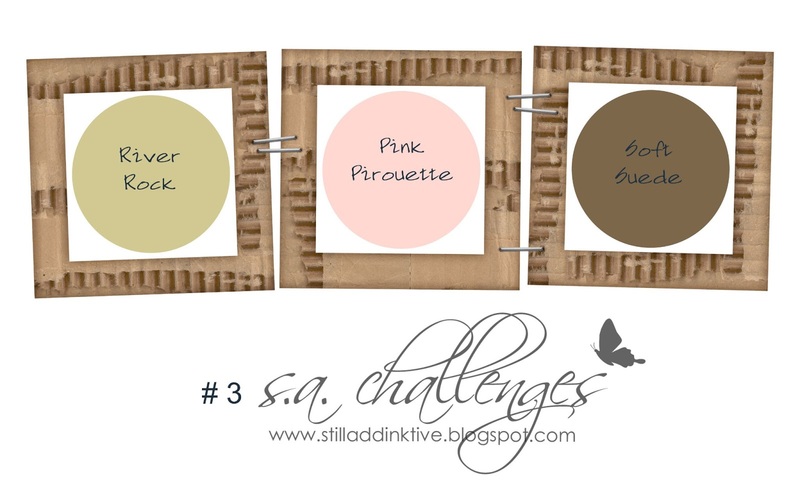 We hope you can join us this week at still addINKtive with these pretty challenge colours. The still addINKtive Design Team have some awesome projects for you to check out - you can find all the links HERE or HERE.